We are a distributor of "Pro Pellet", a Premium clean burning hardwood pellet maunfactured by Fiber By-Products Corporation. Our Pellets are always stored inside. Wood pellets are made mainly of sawdust, shavings, and fines leftover after processing trees for lumber and other wood products. At a pellet mill the material is dried, compressed, and formed into small uniformly sized pellets. The pellets are put into bags that weigh 40 pounds. 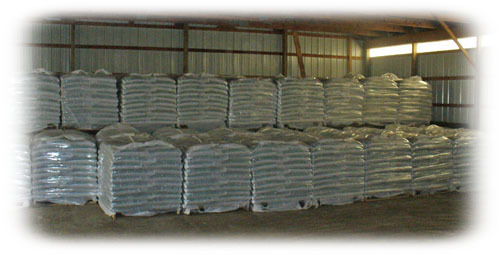 Pellets are sold as a ton with fifty bags on a pallet, or by the bag. 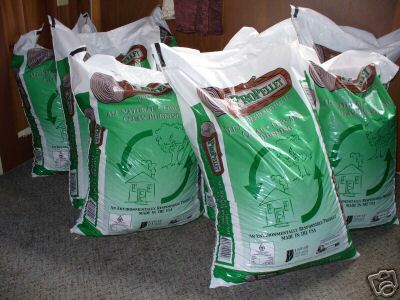 Wood pellets can be purchased at Painesville Pellet and Stove or delivered to your home. Pellet mills follow industry standards to create a product that is consistent in content, density, size, and quality. There are two grades of pellet fuel currently available on the market: standard and premium grades. The main difference between the two is that the amount of the ash content after the pellets burn. Premium grade is the most standard of the two grades, and we sell "Pro Pellet" which is Premium grade. USA Pellet Fuel Manufacturers produce the highest grade of fuel in North America - all of it is classified as premium grade. Pellet manufacturers are encouraged to label their fuel and to have it tested on a regular basis to ensure the protection of consumers. The burning process is highly combustible and produces little residue. 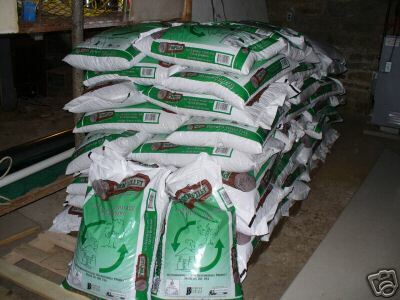 There are many advantages in using wood pellets. No trees are cut to make the pellets they are only made from leftover wood residue. Burning pellet fuel actually helps reduce waste created by lumber production or furniture manufacturing. There are no additives put into the pellets to make them burn longer or more efficiently. Pellet fuel does not smoke or give off any harmful fumes. Using this fuel reduces the need for fossil fuels which are known to be harmful for the environment. Wood is one of the only renewable energy sources. Trees will grow again and again. When you are low on pellets all you have to do is pick up more while you are out or Painesville Pellet and Stove will deliver them to your door. There is much less work involved than for wood burning heaters: no cutting, chopping, stacking, or storing cut wood. A pellet appliance is capable of generating 8,000-500,000 BTU of heat. An entire house can be heated by pellet fuel when the proper appliance is installed. The average stove will be in a room but that heat will transfer to close areas of the house. Some stoves can be connected to existing duct work and transfer heat to the entire house. There are a couple pellet burners that are outdoor boiler type systems that provide hot water to the house. The cost of pellet fuel may depend on the geographic region where it is sold, and the current season. 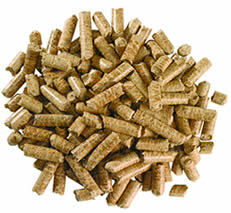 Pellet fuel costs about the same as cord wood and less than most other fuels. Pellet fuel is estimated to be only about one-third the cost of electricity that is used for heating. This could mean a large savings over the years! Whether you live in a condominium in the city or a home in the country, pellet fuel is among the safest and healthiest way to heat. This technology is also valuable for non-residential buildings such as hotels, resorts, restaurants, retail stores, offices, hospitals, and schools. Manufactures of stoves are constantly designing new models that have more heating applications. Over 500,000 homes in North America now enjoy the convenience and warmth of a pellet stove. For more information about pellet fuel, please visit the PELLET FUELS INSTITUTE.